A cooling retreat now sits where a once-hot, exposed backyard offered no respite from the oppressive Texas heat. A single row of Spartan junipers screens this narrow Houston-area backyard from nearby neighbors and shades the surrounding ground. Light-colored gravel keeps the ground plane cool, and the sound of a soft trickle of water echoes in the background. Above it all stands an arbor with a delicately carved pattern casting shadows and sheltering the space below much like a large living canopy would. Designers Michael Constantino and Jeff Halper, of Exterior Worlds Landscaping & Design, not only wanted to shade and screen this backyard from neighbors and shelter it from the sun, they also wanted to transport the homeowner to a place where he could feel calm, relaxed and meditative. Threshold: Gravel runs right up to the bedroom and living room doors. From inside, you step down about 5 inches onto a couple of bluestone pavers like the ones used to connect the two patios. Patio floor and pathway materials: Two granite gravel patios are connected via a 15-foot-long (4.5-meter-long) pathway of 12- by 12-inch (304- by 304-millimeter) bluestone pavers. Mulch, foxtail ferns (Asparagus densiflorus ‘Myers’, USDA zones 9 to 11; find your zone), dwarf mondo grass (Ophiopogon japonicus ‘Nana’, zones 6 to 11) and river pebbles separate the two patios. Anodized aluminum edging keeps everything in place. The pavers were wet set in cement. “This allows for a straight, uniform, level path of disconnected stones that merge with the gravel and planting beautifully,” says Halper. Halper selected the gravel for its association with Zen gardens and the quiet crunch it makes when walked on, giving the space a meditative quality. He also chose it for its permeability: You can plant directly into gravel. “It allows you to merge the garden and the patio in a way paving can’t,” he says. And in areas like Houston, with impervious-surface restrictions, gravel can be a great hardscape solution. 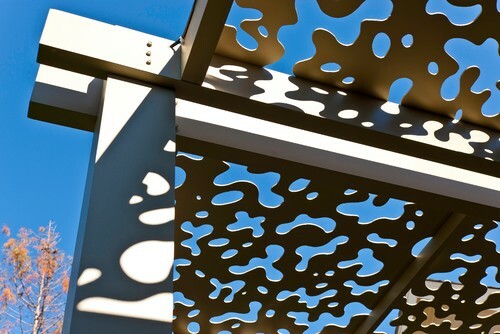 Pergola structure: They fabricated the arbor using solid aluminum and painted it to match the exterior siding. It rains a lot in Houston, and the aluminum will never rust. It’s more expensive than steel but also a lot lighter; Halper says it cost about 40 percent more than steel would have. The beams and posts were notched together for a more woven complexity, also adding to the cost. Patio cover: Aluminum panels that are 3/16 inch thick and roughly 3 feet by 3 feet are attached to the structure with custom clips and screws. 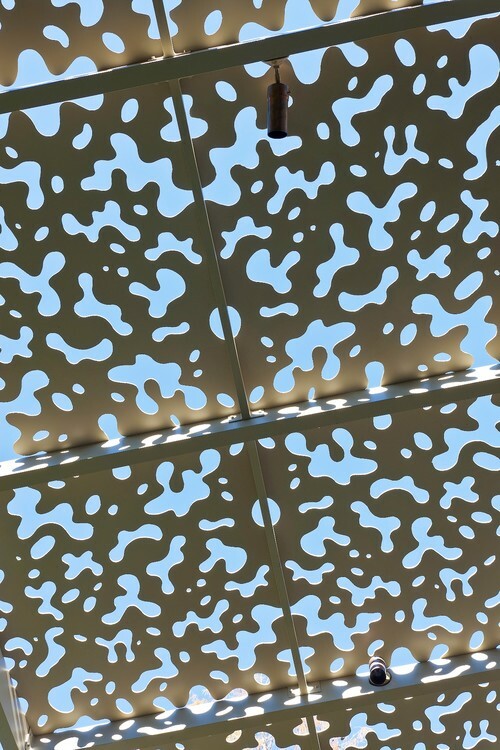 Each panel features a custom, hand-drawn pattern that was transferred to AutoCAD and cut with a water jet. Halper says a laser cutter would have made cleaner cuts, but the material was too thick. The patterns loosely resemble leaves. 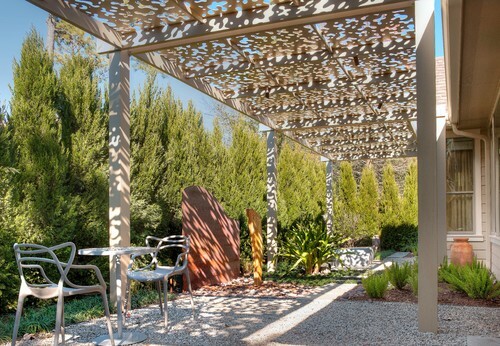 Sunlight streams through during the day, creating dappled shade that resembles that under a large tree canopy, protecting the patio without making it too dark. At night the light from the outdoor bulbs filters through the holes and creates another unique pattern. Attached or detached? The arbor is detached and about 12 inches (304 millimeters) from the eaves. 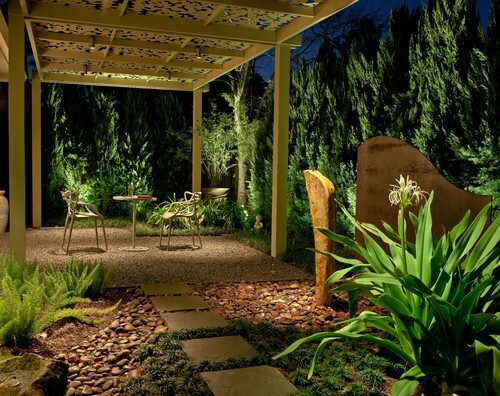 Lights: MR16 lightbulbs illuminate the structure, plantings and hardscape. Their wiring is concealed in the posts and beams, and they are controlled with astronomic timers and switches so they automatically turn on when it gets dark — even accounting for daylight saving time. Cor-Ten sculpture and disappearing fountain: Water in a recirculating fountain flows from the top of the large stone onto the river rock below, generating a faint trickle of water along the rocks. Drains and pumps are concealed below the stone. The long-lasting Cor-Ten adds a dramatic backdrop. Considerations: Many of this patio’s features were chosen for their longevity and relatively low maintenance requirements. The surrounding plants don’t need to be pruned or mowed, the arbor won’t rust, and the lights will last a long time. The fountain is also considerably low maintenance because of its concealed basin. Aluminum made sense for this project, but some projects, depending on their structural needs, will call for steel. Additionally, although the water feature for this project requires relatively little maintenance, Halper says water features always end up being more labor intensive than people expect them to be, due to cleaning and filtration systems. And, though he’s a big fan of gravel, it’s not for everyone, and it can be difficult to walk on barefoot or in heels.